The party will feature the Let’s Dance Band, playing music from across generations that all can appreciate. 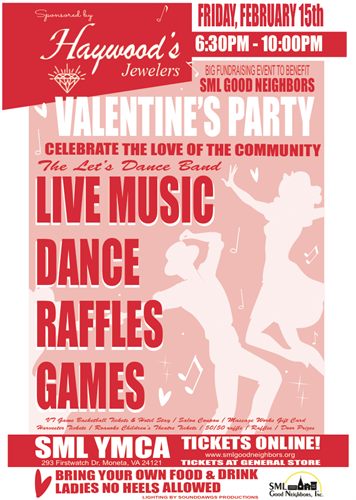 We invite all to join in to celebrate the love of the community; all proceeds benefiting SML Good Neighbors’ children’s programs. Enjoy dancing, raffles, door prizes and more! The event will be a bring your own food and drink (wine and beer welcome - ID’s will be checked at the door). Tickets for the event are $25 and can be purchased at Mama Ann’s Gifts & Goodies (formerly known as The General Store on Scruggs Road) and online at www.smlgoodneighbors.org. Doors open at 6:30pm and the band will begin their first set at 7pm. A reminder that no heels are allowed on the gym floor. Whether you're coming with your sweetheart, solo or with a group of friends, it will be a party that you don’t want to miss.